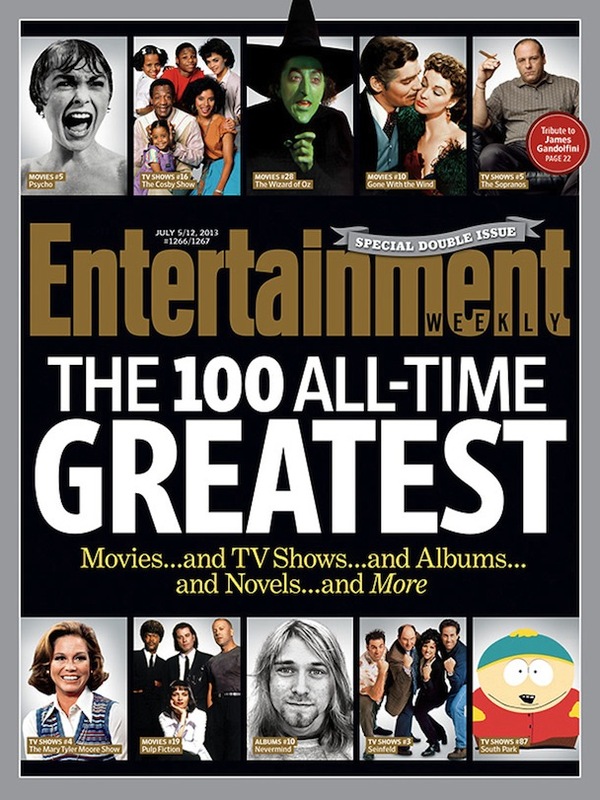 I've been an avid reader-subscriber-follower of Entertainment Weekly for nearly two decades now, and I like to think that my tastes in pop culture closely resemble those found in the pages of this magazine I consider my bible. 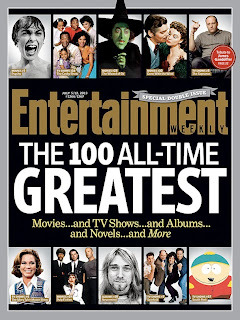 That's why I was particularly excited to pick up a copy and devour its latest double-issue, The 100 All-Time Greatest (in movies, TV, music, books, and more). While I proudly stand by most of EW's rankings (Buffy the Vampire Slayer coming in at #8? Duh), my heart is a little crushed by some glaring omissions (not a single Agatha Christie title in their book list? Not even And Then There Were None?). They can defend themselves all they want, but still! Regardless, while absorbing every title on every list, I've noticed something interesting. Most of the Greatest Movies of All-Time were made before 1980 (76% of them, in fact) while a number of the Greatest TV Shows of All-Time premiered after 1990 (60%). What does this say about the state of each medium? Possibly this: movies are eroding in quality while television continues to experience an extended golden age. Is this no surprise? Maybe this was inevitable; one declines while the other rises. Or is it a matter of withstanding the test of time? After all, when Psycho (#5) came out in 1960, it was considered exploitative; not every critic hailed it as a cinematic masterpiece. Will The Dark Knight (#88) look and feel just as spectacular in 2058? Will we have a revised list of 100 films that kicks it to the curb along with other sacrificed flicks? Or will we experience a reverse effect and have TV sink to cinema's current level of questionable fare? The same could be said for the albums and books included in their respective All-Time Greatest lists. 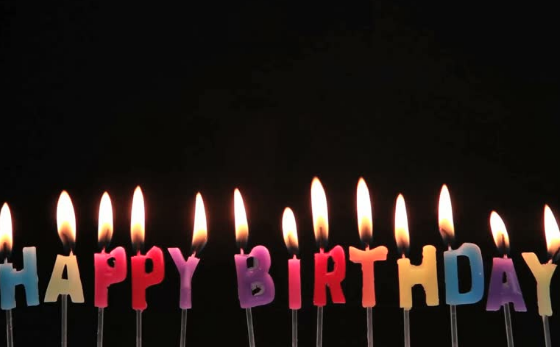 While 27 out of the 100 novels were only published in the last 25 years, 42 out of the 100 albums were released within the same time period (not bad, considering the state of music at the turn of the 21st century). All in all, this begs to ask: where are we headed? With so many offerings inundating pop culture nowadays -- 3 or more wide releases at the multiplex each week, original programming from 100 cable networks, etc -- it's often difficult to filter out the potential greats. But then again, maybe the "greatests" are the greatest because they are the originators, the ones who came first and set the benchmark for all that followed. And, true, it would be hard to top them. Comments? Queries? Perplexities? Leave 'em here.